The flavors of honey, almonds, and vanilla come together in this classic recipe from Bodybuilding.com's iconic LiveFit program. You will make them. You will love them. People start Jamie Eason's LiveFit 12-Week Trainer for a world of reasons that are all their own—seriously, millions have done it, so why would we even guess? They finish it because they love the challenge, love how the workouts make them feel, or just because they love Jamie. And years down the road, they remember LiveFit and keep revisiting it because of the recipes. Recipes may seem like a minor footnote to the epic 12-week transformation powerhouse that is LiveFit, but trust us, Jamie's recipes are ones you'll keep coming back to. We know this because you've told us many, many times. 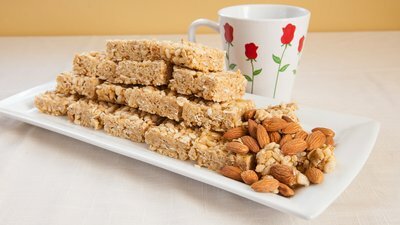 The next time you're looking for something just sweet enough, and with just enough protein, look no further than Jamie Eason's honey almond protein crisps. This is a post-workout treat that will make the toughest routines in LiveFit worth finishing! The best part of all? This is just one of 20 incredible recipes in the full LiveFit program—including Jamie's equally legendary cinnamon protein bread and turkey meatloaf muffins. Go check out all that LiveFit has to offer, but don't expect it to be easy to leave once you're there!